Here is the newest littest macrame purses. I had a few rings laying around the craft room and decided to put them to good use. These are made with 5″ plastic rings. The rings are a couple of different colors, some with a marble look to them. You can see each one individually and up close in the Gallery. We have brown/tan, plum/ivory, cactus/ivory, jade/ivory, black/shadow, almond/pearl, smokey/forest and brownie in the color choices. Each one is lined and measures approximately 7″ wide x 6-7″ long. What do you think? Would you use something this small for a cocktail party, casual or are they better used for a child? 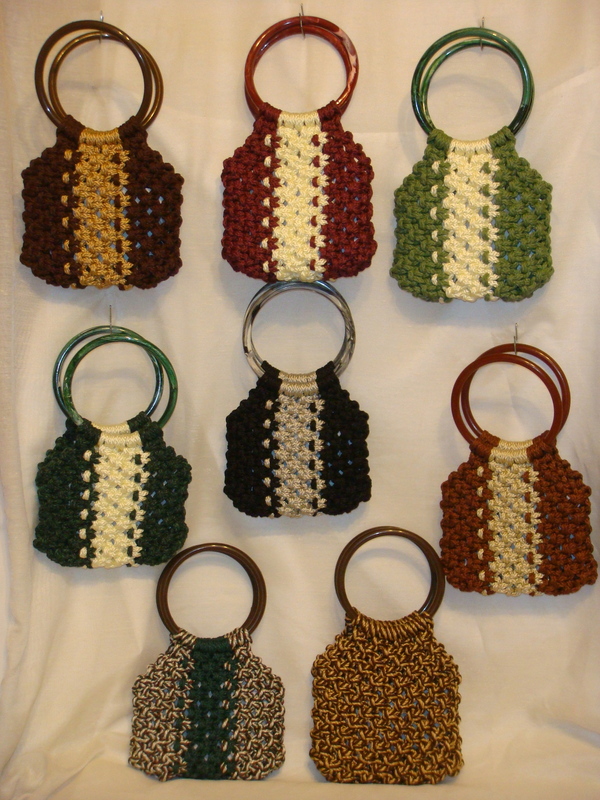 This entry was posted in Announcements, Finished Projects, Main Page and tagged 6mm, macrame purse, rings, square knots. Bookmark the permalink. Since they are small – they could be used for party favors at an elegant party.